Let’s Wander outside of Richmond VA about 50 miles to the beautiful Saude Creek Vineyards in Lanexa Virginia. I couldn’t think of a better spot to land that Friday afternoon in late September, in the midst of some of Virginia’s prettiest countryside. The winery sits atop one of the highest points in New Kent County, with a view of the Pamunkey River. The weather was perfect, in the 70s and sunny, the crowd light around 4 PM. Warm. Sunny. Peaceful. Beautiful Vista. Wine! Life felt very, very good. 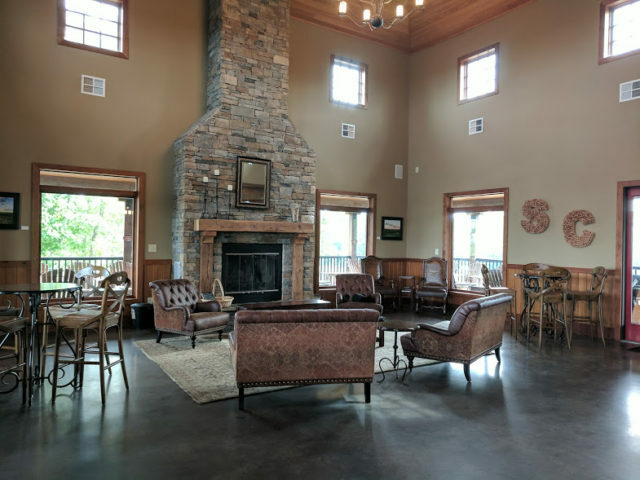 First stop was the tasting room, a lovely space which, according to the Saude Creek website (www.saudecreek.com), is crafted from 160-year old timbers rescued from tobacco warehouses, dramatically enhanced with a soaring stone fireplace. 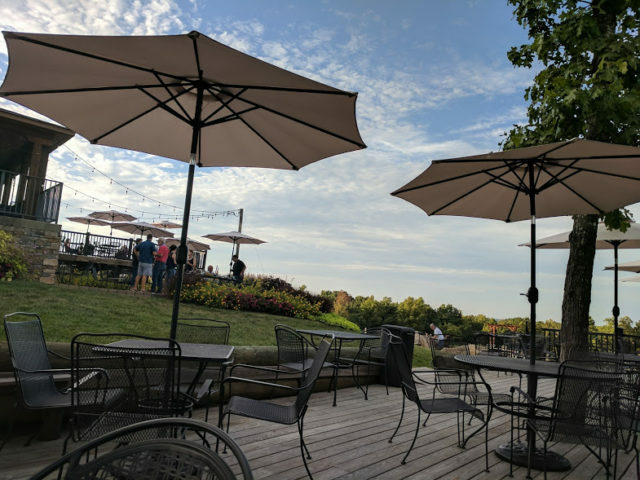 While tasting, you see an open view of the property with a stunning deck/patio system that provides ample seating space all around the grounds. Two wine tastings are available to visitors. The Classic option for $10 includes a tasting of 7 wines from Saude Creek’s regular line. The Premium option for $17 offers an additional 4 samples of their reserve wines. Yes, we opted for the Premium. Listing all the wines on the tasting menu would be cumbersome, so I focus on those that were our particular favorites. While I am personally predisposed to whites, Saude Creek’s signature Saude Creek Red (a light semi-dry red…smooth character, soft tannins and acids, fruit aromas and berry flavors) was my favorite among the reds. It is the base for the winery’s fabulous sangria, available on tap. But I also loved their sweet, very grapey Squires Blend (a sweet light fun blend of Chambourcin and Muscadine, light honeysuckle flavor), which is the base for the winery’s popular summer wine slushies. Among the whites, our two favorites were those Virginia does best: Vidal Blanc (fruity off-dry with grapefruit and peach characteristics) and Traminette (fresh taste of apricot, honey and citrus, mild spiciness characteristic of its Gewurztraminer parent). For our bottle to share, we chose the Traminette and enjoyed it thoroughly. My companion was also very fond of the dryer Paumunkey Fall (a blend of Chardonnay and Chardonel, fruity notes of peach and apricot). Note: These descriptions come from the wineries own wine list/website. We love wine…not as a science or an art…but just for the fun of it! 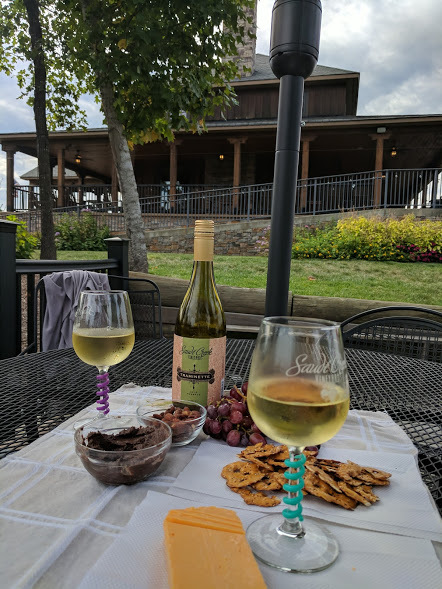 After the tasting, my friend and I retired with our bottle and our wine-friendly picnic of cheese, crackers, grapes, tapenade and the chocolate zucchini bread (which I made with the biggest late-season zucchini I have ever seen). We settled into a quiet table on the lower patio. It was just…perfect. 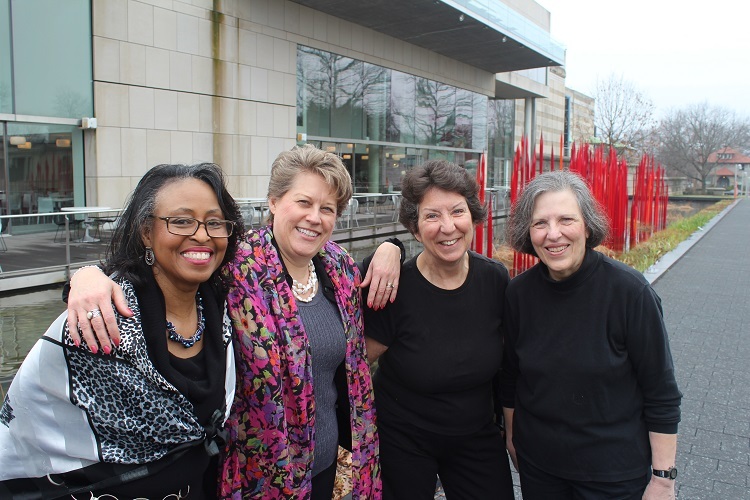 It was a time for reflection of the summer—my friend and I hadn’t seen each other since June—and catching up with news of our girls, who grew up together and now are in their second year of college. It was all kind of bittersweet, with the sublime backdrop of the sun setting over the vines. Around 6 PM, live music happened and a food truck, The Scottish Pig, appeared, offering up fabulous barbeque, our sweet Virginia staple. As we lingered, the sparkly lights came on in the vineyard, and what was so pretty as we first entered, became absolutely magical. I think this is what I love so much about wine and vineyards…the whole atmosphere. It’s what it does to people. Relaxing in a beautiful setting, the conversation gets a little more deep, and we laugh a little more. 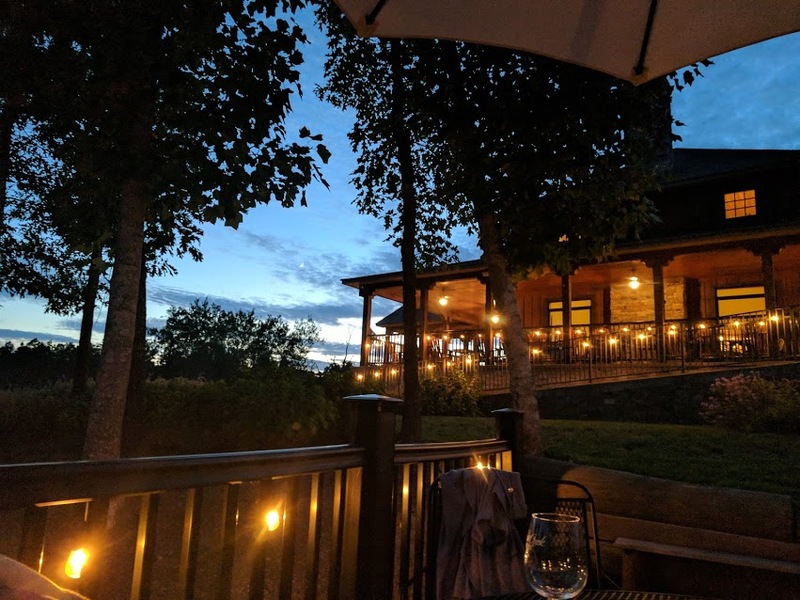 On this evening, Saude Creek Vineyards provided the perfect backdrop for a friends’ reconnection. I love this winery for its wines, but I also love it for the memory. What is your Virginia Wine Trail memory?